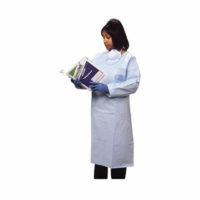 Covidien Chemobloc Poly-Coated Gowns DP5004G CT5502 are splash resistant and have their front and sleeves poly-coated. Chemobloc gowns are constructed of lightweight, non-linting fabric. Closed front and side design for added protection against spills. Long sleeves with knit cuffs. Waist ties with Velcro neck closures. Open back for maximum ventilation. Meets OSHA, ASHP, and ONS recommendations for wearing a gown while preparing or administering chemotherapy drugs.